MONTREAL, QC – Brewpub chain Les 3 Brasseurs/The 3 Brewers has released a new rotational feature beer to mark Canada’s 150th birthday. The 150th – or La 150e, as it’s known in Quebec – is a 4.8% abv and 22 IBU saison-style ale brewed with all Canadian ingredients including several select malts, Canadian Nugget hops, Muskoka cranberries, and Quebec spruce tips. 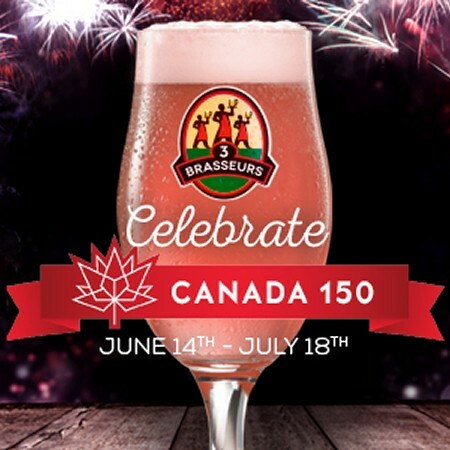 The 150th/La 150e is on tap for a limited time at all Les 3 Brasseurs/The 3 Brewers locations in Quebec and Ontario.